Mega Man Legacy Collection 2's Japanese counterpart, Rockman Classics Collection 2, will receive a limited edition release via E-Capcom. 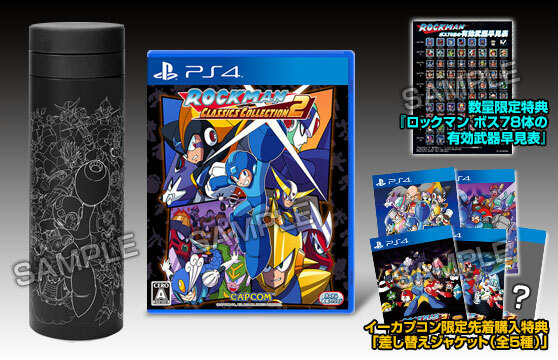 The package includes the game, five alternate cover jackets (the fifth one is a secret, apparently), a Rockman thermos, and a printed Robot Master weakness cheat-sheet. Pre-orders are available now. 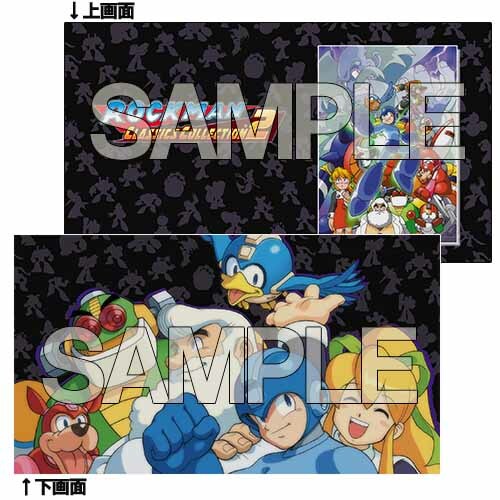 Further, Rockman Unity announced the distribution of other RCC2 goods from posters and lithographs to clear file folders. On a significant note, pre-ording the game from Amazon Japan warrants two exclusive PS4 themes. At this time, it remains to be seen if any of these limited goods will make the jump to North America or Europe. The alternate covers, cheat sheet and themes would be greatly appreciated, I'm sure. More details as they come! Not very likely, tho, since why would hide such selling point? To be honest, for a little while I thought maybe they might've included Mega Man and Bass in secret, since the Mega Man X Collection had the unorthodox Battle & Chase arcade game as an unlockable, but that's advertised on the box, so...yeah, that shot that hope down. Even though M&B had a bad reception among a lot of fans, I do want to try the SNES version. I'd say most fans' reception has warmed up over time ever since Mega Man 9 and 10 were released and the subsequent drought of Mega Man games that happened not long after. Do try the SNES version if you can, while the GBA version is not that bad of a port, the music, the screen resolution and the controls are far better on the SNES. Could this mean a 5th secret game? (Rockman & Forte)?? I can only wish. *Shakes fist* Stop teasing us Capcom!!! No.. Forte cover means Rockman 10.. Forte appears in Rockman 10. Not Rockman & Forte. I think Forte means Rockman 7 going by the way they are ordered. While I don't need it, the weakness poster is cool. I like my fan made poster of all the masters in alphabetical order so that would be neat to put next to it. The thermos looks pretty sweet not gonna lie. Yeah Europe... not counting on that. But if I ever had to order something online I could for that sweet Thermos if I'm honest. So has anyone found a link to order from Amazon.co.jp? I want this collector's edition bad. Likely amazon US will have something. The product descriptions on the site list standard edition for both ps4 and xbox1. "Mega Man Legacy Collection 2 - PlayStation 4 Standard Edition"
At times like these I'm glad I have a Tenso account. Where's Rockman X HD Super Ultra Legacy Collection. Or Just Rockman X HD Remaster. Cmon Capcom at least put some effort in rehashes. Ordered for the thermos, because I'm a sucker. The package is pretty weak. Why would I want box art's for the individual games that say Rockman Collection 2 on it, like a MM8 cover with the collection logo, makes no sense. Capcom couldn't be bothered making some cool alternative art work, minimum effort as usual. If Japan wants to be really exclusive, they should announce Rockman Classics Collection 2 for Nintendo Switch. Seriously, we understand why Capcom of America (like all western developers) have a petty bias against supporting Nintendo, but the Switch is a system designed to cater the ideals of Japanese gamers. Why sell your own people short by not releasing it over there? They didn't say they are against supporting Nintendo. You are assuming wrong. I notice that there is no Rockman Classics Collection first game for PS4 but only for 3dS and a PSN, is that right ? I got my order today but there was no "printed cheat sheet" - just the game, the thermos, and the covers. Never mind, the cheat sheet was inside the game box itself.